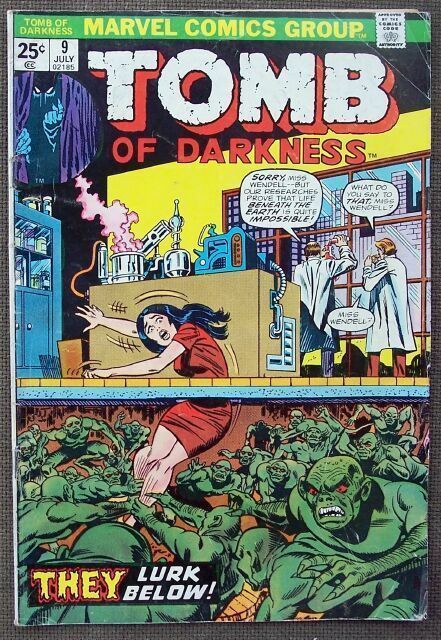 Marvel Comics Group - Tomb of Darkness No. 9, July 1974 Good readable comic book. Marvel Comics Group Four stories 1. The Man in the Tomb 2. Juggernaut 3. Good Morning Mr. Smith 4. The Living and the Dead Vintage ads including one for Strat-O-Matic Baseball Tomb of Darkness Vol. 1 No. 9, July 1974 Condition: Acceptable reading copy, not of collectible quality Natural age toning No missing pages. Very small tear in edge at upper staple affecting center pages (2) A few creases to front cover A small area of discoloration / color transference on back cover Shipping: US buyer to prepay sale amount and shipping of 5.00 USD, add 50 cents per additional comic purchased. Canadian buyer your shipping will be 5.00 USD, add 50 cents per additional comic purchased. International sales welcome, shipping will be 7.00 USD, add 50 cents per additional comic purchased. Payment can be made by Paypal, Bank Check or Money Order, or if from the USA, an US International (pink) Postal Money Order. Canadian buyers will have the option to make payment in Canadian dollars, a conversion will be provided for you. Any questions, please e-mail. Will combine sales where possible to lessen postage. Please check out my other booth items.